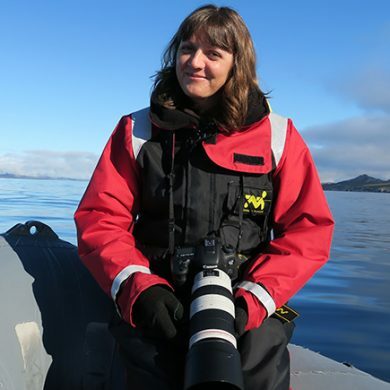 I am a cetacean scientist who has conducted visual (from shore, boat and aerial platforms) and acoustic studies of free-ranging whales, dolphins and porpoises since 1995. My research interests focus primarily on the distribution and ecology of cetacean species and communities, but additionally include photo-identification work (abundance, movements and social structure), research into cetacean acoustic behaviour, anthropogenic impacts on cetacean species, and environmental compliance relating to marine mammals (for example Marine Protected Areas and mitigation guidelines for minimising human impacts). Most recently my work has particularly focussed on ecological studies of the endangered sei whales in the Falkland Islands and the critically-endangered Atlantic humpback dolphins on the west coast of Africa. I have carried out cetacean survey and consultancy work for many organisations including Falklands Conservation, the Joint Nature Conservation Committee, Sea Watch Foundation, Scottish Natural Heritage, Sea Mammal Research Unit (SMRU), SMRU Marine, the University of Aberdeen, Southampton University, Bristol University, Whale and Dolphin Conservation and numerous commercial companies in the marine renewable and oil & gas sectors. I was educated at Sheffield University (BSc Ecology) and the University of Wales, Bangor (MSc Marine Mammal Science), where my academic studies focussed on the schooling behaviour of cetaceans, classification of bottlenose dolphin vocalisations, and analysis of sperm whale codas from the Gulf of Mexico. In 2011, following eight years of cetacean survey work off the west coast of Africa, I completed my PhD (Ecology) at the University of Aberdeen titled “Ecology and conservation of cetaceans in the waters between Angola and the Gulf of Guinea, with focus on the Atlantic humpback dolphin (Sousa teuszii).” My expertise in Angolan and Gulf of Guinea cetaceans has led to my inclusion in the IUCN Cetacean Specialist Group and the CMS Scientific Council’s Aquatic Mammals Working Group (AMWG). I have produced a wide range of peer-reviewed publications related to my research interests. I also regularly peer-review papers for a variety of scientific journals. I am a member of the Editing Board of the African Journal of Marine Science.